New Chromecast adds 1080p/60fps streaming and multi-room audio | What Hi-Fi? Five years since the launch of Google Chromecast, there's a new one. Small but significant tweaks are the order of the day, as Google aims to squeeze more functionality out of its puck-sized, ultra-affordable streamer. 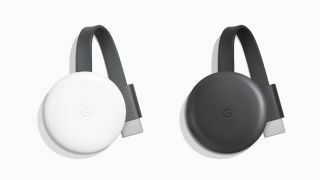 The new Chromecast comes with a fresh design and two new colours - chalk and charcoal (yes, it's sort of like black and white). It keeps the same dimensions but squeezes out a 15 per cent improvement in processing speed and now supports streaming 1080p at 60 frames per second, something that at times could be temperamental on the previous model. Alongside the video upgrade, the new Chromecast will also support multi-room audio streaming. An update later in the year will allow you to add Chromecast to "speaker groups", meaning you can listen to music from Spotify, YouTube Music (and hopefully other streaming services) in perfect harmony across multiple connected, compatible speakers. Chromecast now works seamlessly with Google Home, too, so you can use the voice controls to command connected devices. So you can tell your TV to play a certain video on YouTube or a particular show on Netflix, for example. The new Chromecast will also work with the newly-announced Live Albums feature, which can stream photos from a Google Photos account to a connected TV. The new Chromecast is £35 and available to buy from the Google Store right now.